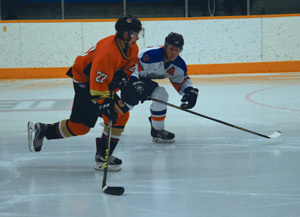 The Coaldale Copperheads are finding their stride as they head into the homestretch of Heritage Junior Hockey regular season play. Friday night the Copperheads headed down the road to Medicine Hat to take on the Cubs. Jayden Bexte paced the Snakes to a 7-3 victory with a hat trick. The Coaldale crew got down 2-0 early in the first period before shaking off the road legs and stomping the Cubs relentlessly for the victory. Besides Bexte’s hat trick, Isiah Day Chief, Sam Paskuski, Tyler Anderson and Levi Anderson also tallied for Coaldale. Andrew Suriano turned away 32 of 35 shots on goal. The Coaldale power play was a factor as it went 2 for 4 on the night. Saturday night the first-place High River Flyers came calling to the Snake Pit where they experienced a relentless Copperheads squad — pummeling the Flyers with 59 shots for an eventual 5-2 victory. Suriano stopped 24 of 26 shots. Scoring for Coaldale was Chase Williamson, Brandyn Howg, Jayden Smith, Brandon Langridge and Sam Paskuski. The race for first place in the south division is wide open with four teams within reach by seasons end. Cochrane and High River are now tied for first with 37 points each. Cochrane has played 30 games while High River has played 31. Coaldale and Okotoks each have 36 points, with both playing 28 games, two games in hand on Cochrane and three on High River. This sets up a great finish to the south division standings, of which hasn’t been seen this tight in the south in memory. The Copperheads are on the road next weekend, taking on the Three Hills Thrashers Saturday night and the Strathmore Wheatland Kings Sunday afternoon. Next home game is not till Saturday, Jan. 27, against Medicine Hat Cubs. This will be the third remaining home game of regular season, therefore, just a reminder, use up those game tickets as will not be valid during playoffs.